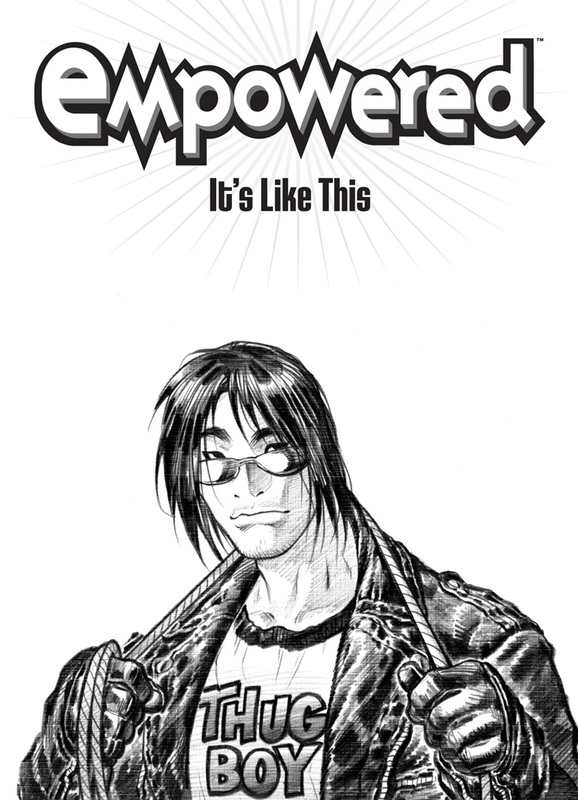 Behold, our first view of Thugboy, the second of Empowered’s Big Three characters to be introduced—or Big Four, I suppose, lest the Caged Demonwolf feel left out. Thugboy doesn’t normally wear T-shirts emblazoned with his nickname, but then again, this is a title-page illustration introducing the character, so I hope you’ll cut him—and, by extension, me—some slack. Looking back, kinda wish I hadn’t saddled him with this particular hairstyle, which was a fairly direct port from how I’d often drawn the character Grunge from Wildstorm/DC’s comic Gen13. Alas, though, I was flying by the proverbial seat of my pants during these early stories, and wasn’t able—or couldn’t be bothered—to work up more detailed character designs before hitting the page. Oh, well.